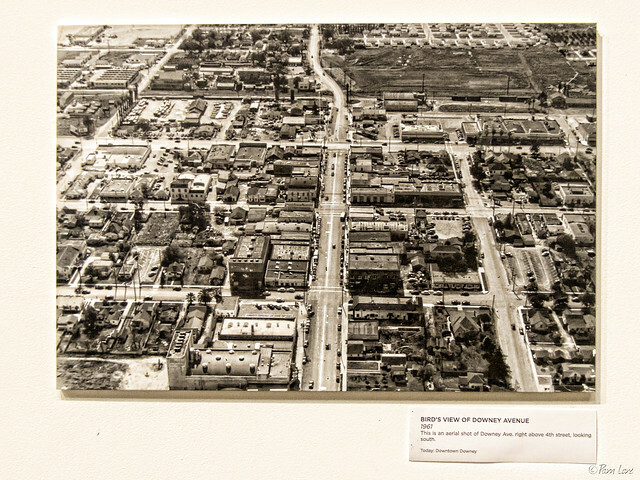 What's not to love about tonight's historical exhibit at Stay Gallery, featuring photographs of downtown Downey ("The Avenue") from 1866 through the 1960s. One of the photographs that had my friends and me puzzling was the one above. From 1961, it's "recent" enough that I should be able to remember some of the details. That's Downey Avenue heading south up the center of the picture. But that big open field beyond the train tracks is a complete mystery to my friends and me. And the upper right corner should be showing the northeast corner of Warren High School. But Warren High, built in 1955, hadn't yet spread to the size it is today. The train station, a short walk from downtown Downey, was still there in 1961. Today, the original building has been torn down and replaced by the Downey Depot Transportation Center where you can catch the DowneyLINK bus. 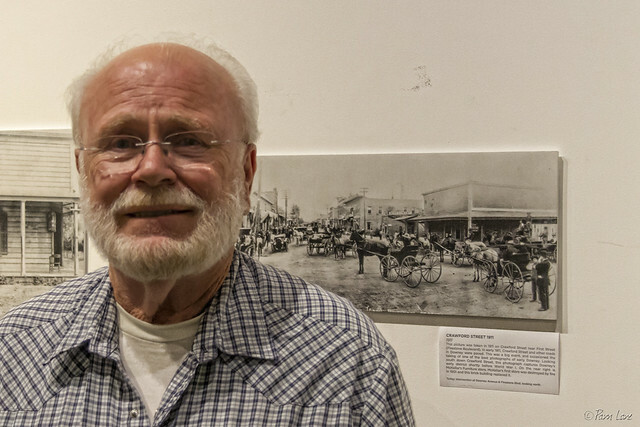 Bob Thompson, president of the Downey Historical Society and life-long Downey resident, was on hand to answer any questions about the pictures and Downey's history. The picture behind him shows Downey Avenue back in 1911, when it was called Crawford Street. Crawford Street was named after Matson Duke Crawford, agent for John G. Downey and attorney for the Downey Land & Improvement Association.